Inspired by several different game series, including Baldur's Gate and its engine, Infinity Engine, Pillars of Eternity is a successful RPG which raised more than 4 million in its kickstarter. You take control of a foreigner arriving in Dyrwood, and due to several unfortunate events you become a Watcher, who is able to read souls, and Awakened, one who's able to access memories of past lives. This comes at a cost of being unable to sleep and eventually go mad. Several objectives are required all at once, and the ending depends on your choices. - Obsidian for creating, in my opinion, a great successor to the infinity engine games I've enjoyed so much throughout the years. It is important to mention that this game was done on patch version 1.03. The latest release of this game (1.05 as of this writing) removed some things that were integral to the run; specifically the ability to kill yourself and then area transition. This game is similiar to the infinity engine games of old. The systems are quite a bit different, and many glitches that worked in the infinity engine don't work here. The feel of the infinity engine is still here though, and many tricks were inspired by the work that was done on those games. 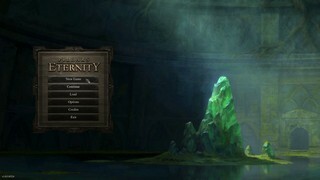 The game is not extremely well optimized as far as software goes; there are many complaints about long loading times and various other issues. One that you can see frequently in this run is the random lag that takes place during dialogues. This is especially clear during the chat with Sagani, as I'm merely mashing the first dialogue choice and it goes by rather slowly. I've done my best to explain the route and tricks used. I don't go in detail too much about things that I think are fairly obvious, but I may have missed something important in doing so. If there's a need for clarification just ask on the forum linked above and I'm sure you'll get an answer. Everything is talked about in chronological order, and tricks are explained at the point in time they're first used in the run. I also assume that you're somewhat familiar with the game and its terminology. All forms of autopause are turned off, and the game is zoomed out to allow for easier maneuvering. Easy difficulty is chosen due to it reducing the number of enemies, allowing for a larger number of encounter skips. Expert mode gets rid of the tutorials and removes unneeded information that slows down the game at times. Trial of Iron is purely for my own sanity, as I wouldn't have to delete the saved games of failed runs manually if this was checked off. Needless to say, there were many failed runs. Character creation is pretty straightforward, we need a Moon Godlike for their healing passive to speed up the process of lowering max health before going into Cilant Lis. The druid class with stag transformation is picked for both their amazing AoE capabilities and the fact they can easily kill themselves later for a major glitch. The maxing of might (damage), int (aoe radius/stag duration), resolve (increased concentration) and the few extra points in constitution help ensure that we get through the beginning both quickly and with a decent chance of survival. When control of the character is gained, the game is put into fast mode and the option for auto-slow in combat is unchecked. For whatever reason it's impossible to turn this off until a new game is started, unlike every other option. Engaging the camp is the fastest way of getting into Cilant Lis, so we get in optimal position for the ensuing battle. Calisca is then used to lower the main character's (MC) health before engaging the camp, because we need to kill the MC using a single spell in just a few minutes. This is accomplished using the inventory action cancel glitch (IAC). By entering and exiting the inventory after doing any action (attacking, casting spells, etc.) the game resets your character's state to simply standing again. This allows us to attack with no time between swings or to chain cast spells, as the game will simply not enter the normal cooldown period after the action has been performed. This only works for the currently selected character, or the character in the leading slot if all characters are selected. The battle at the camp is initiated by Calisca because the enemies will begin to attack her due to an odd occurrence in which she's still considered a party member even though shes not actually in the party and hostile towards you. This allows the MC to stay out of the mob of people and makes the enemies crowd around Calisca, making it easy to hit a large number of them with the Talon AoE ability. Utilizing the IAC rampage attacks of the stag form along with the aoe spell, the camp is disposed of rather quickly. The fact that Calisca didn't die earlier than she did was unfortunate, and cost a little bit of time running back over to finish the job. Once we're inside it's just a matter of fighting the two encounters we can't skip. I take the opportunity here to use disengagement attacks to lower my health even further for a higher chance of success with the suicide. At the last room we set up for killing the druid. This is accomplished by using the spell Sunbeam and pause buffering until "Nina casts Sunbeam" appears on the screen. Once this occurs we can safely click the exit and die during the transition. This series of events is what sets up the biggest glitch in the run - replacing the main character. For whatever reason (I assume it's some sort of failsafe) killing off the main character then doing an area transition will replace the main character with a different one, as well as give you 50000 gold and 3 camping supplies. There are two possible outcomes depending on the area in which you travel to. One character you can get is by travelling to Dyrford Village, which is a level 0 barbarian. However, the most frequent replacement, and the one used in this run is the level 7 cipher named "Player". Player has amazing stats, and some pretty decent equipment for this stage of the game. His most useful feature however, is his spells; particularly the two debug spells he has. These spells have +100 accuracy and stun/prone for an extremely long time due to Player's amazing intellect score. This trivializes almost every fight in the game. So once we leave the ruins, we say goodbye to Nina and make Player the star of the show. After the Thaos cutscene, which we speed up a bit by mashing both of the enter keys and 1 on the numpad, it's a simple trek to Gilded Vale. On the way I take the opportunity to assign a hotkey to the debug stun spell, as well as equipping Player's poleaxe. After the lengthy cutscene in Gilded Vale we head around the trigger for Aloth's encounter and into the Inn. At the inn we rest to advance the plot, as well as hire our main damage dealer for the rest of the game, a rogue. Due to Player already being level 7, we can hire a level 6 rogue right off the bat. I'll explain the choices in the creation and leveling of this character. First off, female is purely preference. Boreal Dwarf is chosen for the accuracy and might bonuses. Rogue for the bonus damage from sneak attack as well as Shadowing Beyond for some skips later on. Maxed out might for damage, constitution to survive the Thaos encounter, intellect so that Shadowing Beyond lasts longer for Sun in Shadow and the rest into dex for (allegedly) faster swings and to help recover faster if I mess up the IAC. No other choice matters past this for the run. I also name her Nina II in honour of our recently fallen druid, and to continue on her legacy. While we're heading to the hanging dwarf I take the opportunity to level up. All skills are saved for the very last level in order to save time. 8 Stealth to skip past some encounters, 1 Athletics to reduce the severity of fatigue penalties and 1 in Mechanics out of habit. Abilities chosen are pure damage boosters. Weapon focus for increased accuracy with the estoc she'll be using shortly, Reckless Assault and Vulnerable attack for accuracy, damage and damage reduction bypass, Shadowing Beyond for obvious reasons and Deep Wounds as damaging filler. Once done leveling, we talk to the hanging dwarf and head over to Caed Nua. While it seems like I should head south to exit the town quicker, heading east allows for the fastest path to the stronghold by going to Esternwood first. I do some small adjustments to save time, as well as apply my modal affects here. Once we're in Caed Nua we grab the NPC Kana. He has two uses: his equipment and a glitch. His estoc is easily the best weapon for this run, as it has huge damage reduction bypass and is already enchanted with "Fine" (1.15x damage +4 accuracy). We hand this to Nina II and use this opportunity to unequip Player's armour for a skip done much later in the run. Using stealth and good pathing we skip every encounter on the outside of the fortress. Inside we fight our first battle, using the debug spell to make short work of the spirits. Kana can kill the purple one with one shot from his gun, but unfortunately that didn't happen here. After the talk we go down to the dungeon with the spiders. We skip past the first pack, but unfortunately need to kill the second set due to both Kana's terrible stealth score and to safely enact the glitch for the next room. Once combat has ended we set up for the glitch. If you travel then initiate conversation during the fadeoutwith importantnpcs (such as companions, Hylea's statue, etc) it will bug out the interface. The dialogue box will stay permanently and no other dialogue will be allowed to trigger. We use Kana to accomplish this and skip past Maerwald's lengthy speech, as well as the small dialogue that appears after he dies. We head back up to the main level with the glitch still in play. However, we need to get rid of it in order to repair the eastern gate and continue on with the game. There are two options here: either kill Kana (very slow), or quit and reload the game. Utilizing the auto-save on the main floor, we get rid of the glitched dialogue and continue on, removing Kana after repairing the gate. In the next area, we follow the path and get Sagani, the ranger. Shes important for the huge skip in chapter 2 due to getting both her and her pet Itumak. After this, a quick walk through the gates of Defiance Bay and we're in chapter 2. Small note at the start here, we skip the chapter 2 intro almost immediately by positioning the cursor over the done button. This is done on every chapter transition to save a little time over the course of the run. Nothing really of note going through Copperlane, I did the mouse movements to the music for a little flair though. Instead of heading into the sewers as we would normally do to advance the plot, we head to the Duchal Palace first. The reasoning for this is quite simple: we're going to skip the entire chapter. This is why Itumak and Sagani were picked up. We need a minimum of 4 characters to do the glitch here. The concept is very similar to that of poly-porting in the infinity engine games actually. Instead of changing the character's size to push them over the wall, we have to abuse the fact that in combat you cannot pass through allies/enemies. When a character is knocked out, they are placed in a psuedo combat state and thus cannot be on the same tile as another character once they get up. I believe this is the reason this skip is possible, but it's purely guesswork on my part. So, by surrounding Itumak near the door, and slightly overlapping his targeting reticle with Player's, Itumak is sent to the closest open space near him after he recovers from KO; which just happens to be the other side of the door. The trigger for setting up the end of chapter events is simply being on the balcony, and as such we skip all of the "mandatory" sidequests and advance the plot. In this run the setup took a bit longer than usual, but overall it was a success. Once all the cutscenes are done, we head to Lady Webb's house and end the chapter. The first order of business is to remove Sagani to allow for some skips later on. We head to Caed Nua, and since we don't have a full party we can simply click the exit button to rearrange our party instead of going into the menu. Stormwall Gorge is pretty basic, a lot of running to the southeastern portion of the map. There is a very easy skip which involves going stealth just before the exit. This cuts out a cutscene, dialogue and an encounter. My best guess for why it works is that the trigger isn't on the ground, but is actually activated on a character being sighted. Elmshore is much the same, simply walking southeast, with stealth to skip an encounter. For whatever reason we can head out of the direct south exit to head to Twin Elms in the east, so we save a bit of time there. After going through the lengthy dialogues to get permission to explore the rest of Twin Elms, I attempt a rather random skip. If you double click the exit at the north, there is a chance that you'll skip the small cutscene where the guard comes up to you and talks. Unfortunately that didn't occur in this run; however, it's only a two second loss at worst, since you need to get access to Elm's Reach manually if it does work. To access the end dungeon, we need to get the favour of at least one god. This involves doing a small sidequest for them. The only one we can do in a reasonable amount of time before going to Teir Evron(and saving a lot of time backtracking) is Hylea's quest. To do this, we have to go to her temple and converse with the dragon there. This involves taking the north exit out of Oldsong and going back into the wilds. Northweald is the sore spot of the run. There is an unfortunate unplanned combat that occurs. Despite using the visual marker for pathing through the area I normally use, the beetle still attacked me. I don't know if it was due to wonky spawning or odd pathfinding, but it still happened. I considered resetting the run right there, but since the RNG was pretty solid through Caed Nua and I could still get a good Thaos fight, I decided to stealth and continue on my way. It's worth noting that if you go invisible, the monsters will not disengage until they touch you. This is very similar to the infinity engine games. Luckily the second beetle decided that he was going to be an exception to the rule, and saved me from losing a couple extra seconds here. This is probably the blackest spot of the run in my opinion, and it's really not that bad. Continuing on, we use stealth to avoid an encounter and trigger the event dialogue (which moves both characters even though Player is still at the entrance of the map). This takes us to the Temple of Hylea. Completing the quest here is easy, as we don't need to fight if we choose the correct dialogue options. Once that's done, we position Nina II in a spot that allows us to skip walking her back down the steps to travel. In Elm's Reach we hit all the triggers and go through all the dialogues. Once that's over with we enter Teir Evron. To speed things up, I have Player grab the activation crystal while Nina II places it in the center. This allows us to speak to the statue of Hylea. Blazing through her dialogue and promising to return the souls of the Hollowborn allows us to receive her boon and get on with the rest of the game. Upon exiting we get yet another cutscene and dialogue, and head back to Oldsong to get to Burial Island. The first thing that happens on Burial Island is, you guessed it, another cutscene and dialogue with Iovara. After this we rest to remove debuffs that Nina II has accumulated for the upcoming small fight. The fight was a bit messy, but I still won in a reasonable amount of time. Using the event dialogue here skips a huge portion of the map, as well as puts you in a good position for the next encounter skip. Because you can only do Shadowing Beyond in combat we need to first engage the ghosts to skip past them. However, in order to exit combat and proceed they have to knockout Player (Nina II is fine as Shadowing Beyond takes her completely off their aggro table). This is where stripping down Player comes into play. The spot he's positioned in allows for all the ghosts to surround him, as if one can't touch him after he's gone unconscious the game will be permanently locked in combat. This spot is also far enough away that the ghosts will not re-engage in combat once Player gets back up. During the time that Player is getting hit, Nina II is sent along a specific path around the pit in order to skip a trigger for a small cutscene before entering. By approaching the event dialogue from the north, we skip it entirely. We first rest to regain both usages of Shadowing Beyond. In a move very similar to the encounter skip on the previous map, we stealth through the entire level by having Player engage a single specter (this specter rejoins his "pack" if you save and load here oddly enough) to lock Nina II in combat and give her enough Shadowing Beyond time to reach the required event trigger. I want to make a special mention about the trap I walk over. This trap is extremely evil, as it has a chance of instantly vaporizing the character walking over it. There were a hefty number of great runs that were ended by this trap. Luckily, this was not one of them. Once she's in the room, we usually have to go back to deal with the ghost using IAC. However, this run was pretty lucky in the fact that Player killed the ghost automatically. Since combat had ended, the event triggered and transported Player to Iovara's soul prison, skipping all encounters on the floor. After going through the lengthiest dialogue in the game, we rest and head down to the next level. On the second level of Sun in Shadow, there is a relatively new glitch (at the time of this recording) that's performed right at the start. If you enter a cutscene loading zone, then hit the level up button, you will be able to level up your character while the cutscene plays out in the background. This is only true for cutscenes without dialogue, like the one here, as dialogue will force you out of the level up screen. One downside is that the cursor goes invisible, so you have to feel around a little to hit the right buttons. Since level 7 is a pretty decent boost in accuracy and health for the Thaos fight, it's well worth it to level up here as it costs no time using this trick. After the cutscene, we grab the boots of speed from the ashen corpse. Since the boots are such a huge movement speed increase we equip them immediately, as well as re-equipping Player's armor for the Thaos fight. In a stroke of good luck, we are able to stealth past the revenants without using Shadowing Beyond. By going into the center of the black mass here it forces a teleport of Player to Nina II's position for the cutscene. Once the cutscene is over we begin running to the southeast. If we run down far enough we can make the 3 revenants that appear leash back to their spawn point and skip combat with them. Also, being in combat allows us to skip Wael's dialogue here. The shadow drake, unfortunately, cannot be leashed and we have to kill him. Luckily he's weak against piercing damage and dies fairly quickly to the estoc and IAC attacks. Once combat is ended, I set Nina II up in a position near the exit door and have Player trigger the cutscene in the black mass. Once the cutscene has finished I enter the door before the monsters spawn, skipping another encounter. Due to the version I'm playing in, I have to re-equip the boots of speed in order to get the movement speed bonus after combat has taken place. Once that's done I quickly zip down to the trigger that initiates the Thaos fight. It's worth noting that you can level up to 8 before the fight, but my testing showed it wasn't a time save compared to the time wasted leveling up. If someone could manage to shoot through the level up screen while utilizing the cutscene level up glitch, it would definitely be worth it. I don't see that happening though. I'll start here with a brief overview of the Thaos fight. You have to kill all 3 enemies to end the encounter. You cannot end combat once Thaos is dead using Shadowing Beyond. Woedica's Judge is particularly dangerous, as all of his attacks knock their target prone. Woedica's Headsman does pretty high damage and knocks back on attack. Both of the statues do AoE fire damage once they die. Thaos himself can cast some pretty damaging spells, and if he gets one off, you will almost certainly die from the statue's explosions later in the fight. Overall, it's a pretty rough fight, even with the debug spells. The strategy is fairly simple though. Normally if you damage Thaos to below a certain threshold he'll channel his soul into one of the statues and become invulnerable. Once the statue he's possessing dies, he'll return to his own body and be fully healed. However, if you kill him while he's stunned this action will not occur. Unfortunately he has to be pretty deep into the stun, as if he reaches about 5 seconds left on it the soul channel will still trigger. For this reason we first stun the two statues (Judge first to avoid the prone) and then finally Thaos. During this time I don't send Nina II over to attack as I need her to not be on cooldown from an autoattack once he's finally stunned. Using well timed IAC attacks I have to get lucky and kill him in the short period of stun time that I have. In this run I stunned him just in time to stop his AoE fire attack, as well as killed him fast enough to skip the soul channel. The rest of the fight is ensuring the statues stay stunned and then killing them with IAC attacks. I had pretty poor accuracy rolls on the Judge which cost me a 1 cycle of stuns. After the second stun on the Headsman though, my luck improved and I killed him in record time. I also had a few errors with my IAC while I was swapping targets, but in the end it cost maybe 3 seconds. Once the fight is over we go through the dialogue, head over to the soul catcher and start up the epilogue. This run is pretty solid in my opinion. All of the important tricks were done successfully first try and in good time. RNG was co-operative pretty much all the way through and bad luck/errors only cost me a little less than 10 seconds overall. That being said, there is always room for improvement. In my case, I'm quite happy with this run as is and don't have much desire to pursue this category any further. To anyone who wants to improve this run, I wish you the best of luck - hopefully you can discover something new and totally blow this game out of the water.